This image reveals previously hidden features around an area known as Mare Serenitatis, or the Sea of Serenity, which is near the Apollo 17 landing site. Signals beamed from the Arecibo Observatory in Puerto Rico — the world's largest radio dish, with a diameter of 1,000 feet (305 meters) — penetrated deep into the moon. They then bounced back and were detected by the Green Bank Telescope in West Virginia, the planet's biggest, fully steerable radio telescope at 330 feet (100 m) wide. Researchers use this technique, called bistatic radar, to study many solar system objects, from asteroids to other planets. 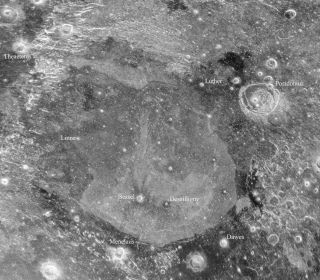 In this case, it revealed subsurface details in two lunar locales, the Sea of Serenity and a crater called Aristillus. The new radar observations allow scientists to peer 33 to 50 feet (10 to 15 m) beneath the Sea of Serenity, which is near the site where NASA's final manned lunar effort, the Apollo 17 mission, touched down in December 1972. Light and dark areas visible in the images reveal details of rock and dust composition, researchers said. This image is an observation of the lunar impact crater known as Aristillus. The radar echoes reveal geologic features of the large debris field created by the force of the impact. The dark “halo” surrounding the crater is due to pulverized debris beyond the rugged, radar-bright rim deposits. The radar images also provide a new perspective on Aristillus crater, which is about 34 miles (55 kilometers) wide and 2.2 miles (3.5 km) deep. "The dark 'halo' surrounding the crater is due to pulverized debris beyond the rugged, radar-bright rim deposits," representatives of the National Radio Astronomy Observatory, which operates the Green Bank Telescope and a number of other instruments, said in a statement. "The image also shows traces of lava-like features produced when lunar rock melted from the heat of the impact," they added. Peering beneath the moon's dusty surface should help scientists better understand the history and evolution of Earth's natural satellite, researchers said. The new radar images could also improve knowledge about previous lunar landing sites and aid mission planners thinking about where to send future moon-exploration efforts, they added.